Hurrah! According to the Grauniad, the blue Smartie is set to make a comeback. 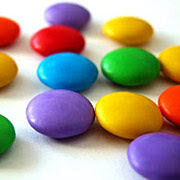 The blue smartie is undeniably king, just as the brown M&M is a shoddy waste of time. The blue smartie might be hiding unknown Wonkaesque strangenesses beneath its shiny suit. The brown M&M will never contain anything but chocolate. Which reminds me: why oh why did they discontinue these? It’s a surprise, and some chocolate, and a really pathetic model of a crocodile on a lilo. Oh, hang on, that was Kinder eggs. Same weird mixture of different types of chocolate, though. M&S have stopped doing their layered thing with dark, white and milk all at once, I see. Am I the only one that likes these things? Finally finished The Joshua Files: Invisible City by MG Harris (10+, contemporary adventure): thank god I managed to have the last 100 pages to myself without distractions, as I would have throttled anyone who interrupted. I will admit here and now the author is a mate (you’ll find a link to her blog over on the right), but sod bias: this truly is the real thing, a brilliant modern thriller-with-a-brain which starts strongly and then absolutely soars. Josh Garcia’s life turns upside down when his archaeologist father mysteriously dies in Mexico, sending him in pursuit of the fabled Ix Codex, a mythical Mayan text which it is death to touch. All the classic ingredients are here: a coded letter, torn in half, containing a prophecy; a sinister organisation in pursuit; stakes that get raised from the mundane (proving his father wasn’t unfaithful to his mum) to the epic (potentially saving the world). But alongside the Bondesque car chases and exotic locations, there’s genuine heart. Josh is challenged not only by the usual gun-waving types but also by heartbreaking personal loss, and the sensitive way his emotional state is handled – without ever detracting from the pace – is what makes this such a memorable rollercoaster to ride. Half high-speed sledging down a hill going ‘wheee!’, half sitting in an igloo all alone. Big Woo went to print on Friday (except that it didn’t, but hopefully will today), there’s a bound proof of the US edition on its way across the Atlantic, exciting things are popping up in the trade press: all quite skippiness-inducing, if distracting. But Biscuits & Lies is limping along (mostly notes and ideas and new bits of plot still, though there are actual whole paragraphs that might one day see print now). And my igloo has a kettle. Cloverfield (brilliant, clever, go and see it), Juno (brillianter, cleverer, go and see it even quicker-er), epic curry (homemade pakoras, korma with real coconut, eleventy-vegetable balti: was more impressive before I fed it to someone allergic to anything spicy, oops), making a Mii for the Wii that looks like Justin Lee Collins, failing to not read ONTD, squeaking with delight at the rugby, going out for coffee a lot, writing this during official ‘work’ hours, thinking a bit too much about chocolate (see above). Bless you for that luvvy! What a gorgeous thing to say! And would you like to write all my synopsises from now on? – you did a breathtaking job, better than I ever could!Very very glad you enjoyed it. You’re welcome! I enjoyed it SO much: had me leaping about the room and squeaking. Can’t wait to catch up so I can flail about particular bits (that I wouldn’t spoil in a million years, because you earn their pay off so perfectly). You are scarily talented, woman: when’s the next one out?Nil points for wussing out if Cloverfield, though. You missed a good ‘un. Saw Juno at the weekend – loved it. I unfortunately read the incredibly annoying synopsis on the cineworld website while trying to work out when it was on: http://www.cineworld.co.uk/cinematheque/Cinematheque.jgi?#ancre which appears to spoil the entire plot.However, it seems that the person who wrote it watched a different film. So that was alright.